Traditional style rigging screw with threaded toggle at each end, manufactured from high tensile forged bronze with a polished chromium finish by Sta-Lok Terminals Ltd.
Sta-Lok turnbuckles with toggle and toggle ends have been engineered and manufactured in the UK. Sta-Lok products are expertly manufactured to the highest standards here in the UK, with a worldwide reputation for outstanding quality, reliability and value. Also called turnbuckles, rigging screws, tensioners, bottle screws or adjusters. 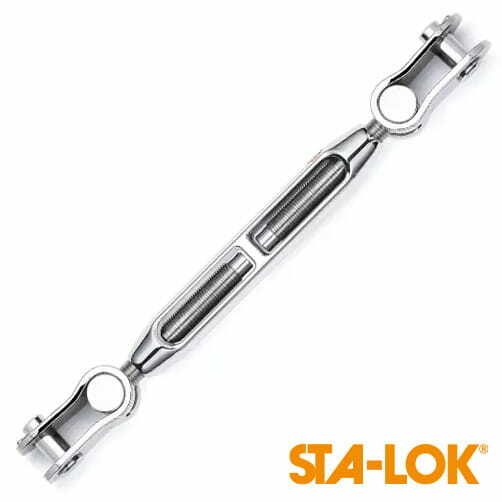 The Sta-Lok bronze turnbuckle is forged from high tensile bronze alloy and the turnbuckle's aerodynamic design provides one of the strongest bronze turnbuckles in the world today. Highly finished in polished chromium, Sta-Lok bronze marine body turnbuckles are available with a wide range of stainless steel end fittings to suit most rigging applications. 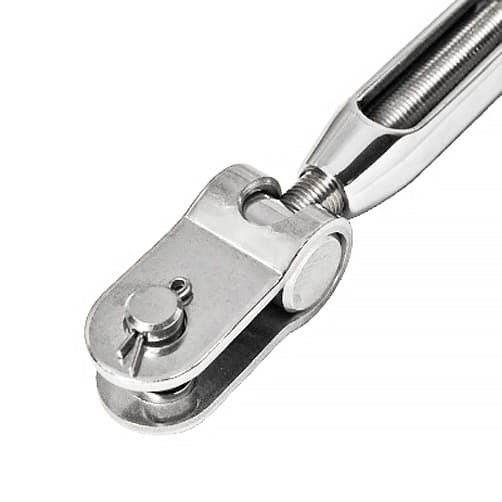 Stainless Steel Turnbuckles. Demonstration of the mechanics of closed body stainless steel turnbuckles.